TLJ Daily E-Mail Alert No. 781, November 18, 2003. November 18, 2003, 9:00 AM ET, Alert No. 781. 11/17. A group of groups released a paper titled "Position Statement on the Use of RFID on Consumer Products". It argues that "Radio Frequency Identification (RFID) is an item-tagging technology with profound societal implications. Used improperly, RFID has the potential to jeopardize consumer privacy, reduce or eliminate purchasing anonymity, and threaten civil liberties." The paper argues that "First, RFID must undergo a formal technology assessment, and RFID tags should not be affixed to individual consumer products until such assessment takes place. Second, RFID implementation must be guided by Principles of Fair Information Practice. Third, certain uses of RFID should be flatly prohibited." Consumer food and beverage producers, and grocers and other retailers, plan to introduce RFID tags as a means to reduce the cost, and improve the accuracy, of inventory and distribution management. The technology offers the promise of lower prices for consumers. Nevertheless, the just released report argues that there are several threats to consumer privacy and civil liberties. First, "RFID tags can be embedded into/onto objects and documents without the knowledge of the individual who obtains those items. As radio waves travel easily and silently through fabric, plastic, and other materials, it is possible to read RFID tags sewn into clothing or affixed to objects contained in purses, shopping bags, suitcases, and more." Second, the report states, "RFID deployment requires the creation of massive databases containing unique tag data. These records could be linked with personal identifying data, especially as computer memory and processing capacities expand." Moreover, "Tags can be read from a distance, not restricted to line of sight, by readers that can be incorporated invisibly into nearly any environment where human beings or items congregate. RFID readers have already been experimentally embedded into floor tiles, woven into carpeting and floor mats, hidden in doorways, and seamlessly incorporated into retail shelving and counters, making it virtually impossible for a consumer to know when or if he or she was being ``scanned.´´"
The report also asserts that "If personal identity were linked with unique RFID tag numbers, individuals could be profiled and tracked without their knowledge or consent. For example, a tag embedded in a shoe could serve as a de facto identifier for the person wearing it." CALEA, as written, and as implemented by Federal Communications Commission (FCC) rules, applies to certain communications technologies, but not RFID tags. The paper was released at an event titled "RFID Privacy Workshop" which was held on November 15 at the Massachusetts Institute of Technology (MIT) in Cambridge, Massachusetts. See, workshop agenda, which contains hyperlinks to some of the participants' presentations. The paper was issued or endorsed by, among others, the Consumers Against Supermarket Privacy Invasion and Numbering (CASPIAN), Privacy Rights Clearinghouse, American Civil Liberties Union (ACLU), Center for Democracy and Technology (CDT), Electronic Privacy Information Center (EPIC). For more information, see the EPIC's RFID web page. Jim Harper, the editor of Privacilla.org, stated in a release that "The report is as much science fantasy as legitimate privacy concern". He continued that "A good imagination can come up with concerns about RFID tags, but concerns about commercial use of RFID tags fall apart under real-world analysis ... Under any scenario, there just isn't going to be post-sale data-collection about the movement of canned peaches." He also wrote that "This is important because bogus anti-RFID hype can really harm consumers ... The sooner this technology can lower the price of baby formula and diapers, the better." "Each concern listed in the report is premised on RFID tags being linked to particular people at the point of sale. This could be done by linking check payments, credit cards, and bank cards to purchases. The same potential exists today with the bar codes on nearly every consumer product today", wrote Harper. "If it worries consumers, they'll carry cash". 11/17. President Bush wrote a statement to the Senate urging that it ratify the Council of Europe (COE) Convention on Cybercrime. The U.S. signed the Convention November 23, 2001 in Budapest, Hungary. Bush wrote that "The United States, in its capacity as an observer at the Council of Europe, participated actively in the elaboration of the Convention, which is the only multilateral treaty to address the problems of computer-related crime and electronic evidence gathering." He continued that "The Convention promises to be an effective tool in the global effort to combat computer-related crime. It requires Parties to criminalize, if they have not already done so, certain conduct that is committed through, against, or related to computer systems. Such substantive crimes include offenses against the ``confidentiality, integrity and availability´´ of computer data and systems, as well as using computer systems to engage in conduct that would be criminal if committed outside the cyber-realm, i.e., forgery, fraud, child pormography, and certain copyright-related offenses. The Convention also requires Parties to have the ability to investigate computer-related crime effectively and to obtain electronic evidence in all types of criminal investigations and proceedings. He also stated that "By providing for broad international cooperation in the form of extradition and mutual legal assistance, the Cybercrime Convention would remove or minimize legal obstacles to inter-national cooperation that delay or endanger U.S. investigations and prosecutions of computer-related crime. As such, it would help deny ``safe havens´´ to criminals, including terrorists, who can cause damage to U.S. interests from abroad using computer systems. At the same time, the Convention contains safeguards that protect civil liberties and other legitimate interests." Bush recommended "that the Senate give early and favorable consideration to the Cybercrime Convention, and that it give its advice and consent to ratification, subject to the reservations, declarations, and understanding described in the accompanying report of the Department of State." See, the Department of Justice's (DOJ) summary of the Convention, the Center for Democracy and Technology's (CDT) international cyber crime web page, and Privacy International's cyber crime web page. See also, TLJ story titled "COE Cyber Crime Treaty Debated", December 11, 2000; story titled "Bush Administration Releases Final Cyber Security Plan" in TLJ Daily E-Mail Alert No. 605, February 17, 2003; and story titled "State Department Official Addresses International Cyber Security" in TLJ Daily E-Mail Alert No. 737, September 11, 2003. 11/15. Attorney General John Ashcroft gave a speech to the Federalist Society in Washington DC in which he defended the PATRIOT Act. Ashcroft (at right) stated that "Throughout the Patriot Act, tools provided to fight terrorism require that the same predication be established before a federal judge as with similar tools provided to fight other crime." "In addition, the Patriot Act includes yet another layer of judicial scrutiny by providing a civil remedy in the event of abuse. Section 223 of the Patriot Act allows citizens to seek monetary damages for willful violations of the Patriot Act. This civil remedy serves as a further deterrent against infringement upon individual liberties", said Ashcroft. "Given our overly litigious society, you are probably wondering how many such civil cases have been filed to date. It is a figure as astronomical as the library searches. Zero." "There is a simple reason for this", he said; "the Patriot has not been used to infringe upon individual liberty." He concluded that "Many of you have heard the hue and cry from critics of the Patriot Act who allege that liberty has been eroded. But more telling is what you have not heard. You have not heard of one single case in which a judge has found an abuse of the Patriot Act because, again, there have been no abuses." The Senate Judiciary Committee is scheduled to hold a hearing on November 18, 2003, to "examine America after the 9/11 terrorist attacks". The scheduled witnesses include Viet Dinh, who is now a professor at Georgetown University Law Center, but who was previously Assistant Attorney General in charge of the Office of Legal Policy. He was active in drafting the PATRIOT Act. The witness list also includes critics of the PATRIOT Act, and the Department of Justice's implementation of the Act. Attorney General Ashcroft is not a scheduled witness. Nor did he testify at the Committee's previous hearing that addressed the PATRIOT Act. See, story titled "Senate Committee Holds Hearing on PATRIOT Act" in TLJ Daily E-Mail Alert No. 763, October 22, 2003. While Ashcroft has not appeared before either the House or Senate Judiciary Committees recently, he has given several unannounced speeches to friendly audiences. 11/18. In many of the public policy debates in Washington DC proponents of various positions assert that their proposals will further innovation, invention, and creation. The arguments often continue that this, in turn, will create jobs, wealth, prosperity, and now, homeland security. Claims of this nature are not limited to debates over patent, copyright, and other intellectual property laws. They are central to debates over government involvement in research and development, funding for universities, education policy, immigration policy, taxation, and communications policy. 11/18. President Bush gave a speech in Washington DC at the National Endowment for Democracy on November 6, 2003 in which he advocated promoting democracy in Iraq and the Middle East. He revealed that underlying his argument about U.S. foreign policy is an economic theory regarding the source of growth and prosperity, including the role of innovation and creativity. In Bush's economic theory, freedom and liberty lead to creativity, innovation and technological progress, which in turn, lead to social progress, wealth and prosperity. Said Bush, "the prosperity, and social vitality and technological progress of a people are directly determined by extent of their liberty. Freedom honors and unleashes human creativity -- and creativity determines the strength and wealth of nations. Liberty is both the plan of Heaven for humanity, and the best hope for progress here on Earth." Bush (at left) elaborated that "There are governments that still fear and repress independent thought and creativity, and private enterprise -- the human qualities that make for a -- strong and successful societies. Even when these nations have vast natural resources, they do not respect or develop their greatest resources -- the talent and energy of men and women working and living in freedom." He did not define freedom or liberty in a single sentence or paragraph. However, he identified numerous elements throughout his speech. It means "limiting the power of the state". It also means economic liberty, including "markets", "free enterprise", "property rights", and "consistent and impartial rule of law". It also means political rights, including "democracy", "political parties", "labor unions", and "independent newspapers and broadcast media". Finally, it means "religious liberty". 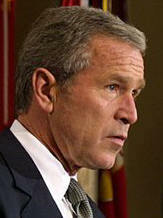 Bush rejected the notion freedom and liberty can be broken down into categories, with certain categories of freedom allowed, and others denied. He said that "freedom is indivisible". He illustrated this point with the example of China, which he said has offered economic freedom, but not democracy or religious rights. He predicted that "China's leaders will also discover that freedom is indivisible -- that social and religious freedom is also essential to national greatness and national dignity." He also advanced several ancillary arguments. First, he argued that allowing economic rights leads to other rights. He said that, "Eventually, men and women who are allowed to control their own wealth will insist on controlling their own lives and their own country". Bush also stated that in the future, historians will note that "the advance of markets and free enterprise helped to create a middle class that was confident enough to demand their own rights." Second, he argued that technology leads not only to economic growth, but also to greater freedom. He said that when historians write their histories "They will point to the role of technology in frustrating censorship and central control -- and marvel at the power of instant communications to spread the truth, the news, and courage across borders." World leaders have given countless speeches advocating democracy and freedom. Some even give speeches arguing that free enterprise and property rights leads to prosperity. Three things are significant about Bush's speech. All of these have implications for public policy. First, he assigns a central role to creativity and innovation, while expressly rejecting several other theories regarding the source of national wealth. He rejected communism, central planning, militarism, and theocratic terror, as one would expect of a Republican President. However, he also left out of his speech many factors that other American leaders and economists emphasize, such as natural resources, government spending, monetary policy, and the mysterious role of capital. Also, Bush referenced "education" just once, and gave it no emphasis or elaboration. Second, he stated that freedom is the cause of creativity and innovation. Charles Murray just wrote a book titled Human Accomplishment: the Pursuit of Excellence in the Arts and Sciences, 800 B.C. to 1950; Paul Johnson just wrote a book titled Art: A New History. Both argue that freedom is important for innovation. (Both of these books are addressed in subsequent articles in this series.) In contrast, many other people offer theories for promoting innovation that either leave human freedom out, or assign it a minor role. (These viewpoints are also addressed in forthcoming articles.) The point is, all argue for the importance of innovation, but few place human freedom at the center of their theories about what leads to creation and innovation. Third, Bush identified who it is that innovates. In his speech, it is "people" and "men and women", but never to companies or corporations, who need freedom, and who create and innovate. In contrast, when many other people talk about innovation, they refer to large entities. That is, large corporations need research and development tax breaks to incent them to innovate, large corporations need more H1B visas to bring in skilled workers from abroad to enable the corporations to innovate, universities need more money to conduct research and train more scientists and engineers, so that large corporations will have people to hire, and so forth. Individuals are left out of many explanations of innovation. In many of these explanations, people merely have jobs at entities; but it is the entities that innovate. The Senate will meet at 9:30 AM. It will resume consideration of consideration of HR 2861, the Departments of Veterans Affairs and Housing and Urban Development Appropriations Act, Fiscal Year 2004. TIME TBA. The Senate Commerce Committee will hold a business meeting to consider pending nominations. Location: Room S-216, Capitol Building. 4:00 PM. The Senate Armed Services Committee will hold a hearing to examine the nomination of Michael Wynne to be Under Secretary of Defense for Acquisition, Technology, and Logistics. Location: Room 222, Russell Building. 10:00 AM. The House Judiciary Committee will hold an oversight hearing titled "Saving the Savings Clause: Congressional Intent, the Trinko Case, and the Role of the Antitrust Laws in Promoting Competition in the Telecom Sector". See, TLJ story titled "Supreme Court Grants Certiorari in Verizon v. Trinko", March 10, 2003. The Supreme Court has heard oral argument, but not released its opinion, in this case. The hearing will be webcast. Press contact: Jeff Lungren or Terry Shawn at 202 225-2492. Location: Room 2141 Rayburn Building. 2:00 PM. The Republican leadership of the House Select Committee on Homeland Security will hold a press conference to announce a legislative proposal that would set milestones and metrics to be met by the Department of Homeland Security (DHS). The participants will include Rep. Chris Cox (R-CA) (Chairman of the Committee), and Rep. Mac Thornberry (R-TX) (Chairman of the Subcommittee on Cybersecurity, Science, Research, and Development). Location: Room HC-6, Capitol Building. 12:00 PM. The Department of Commerce's (DOC) Technology Administration (TA) will release a report on federal laboratory practices that are contributing to local economic development efforts. Assistant Secretary Bruce Mehlman will speak at this luncheon briefing. See, notice. RSVP to Sophia Norris at norriss@asme.org or 202 785-3756. Location: Room B-338, Rayburn Building. 11/12. The Federal Communications Commission (FCC) published a notice in the Federal Register summarizing, and setting comment deadlines for, it notice of proposed rulemaking pertaining (NPRM) to promoting spectrum based services in rural areas. The deadline to submit comments is December 29, 2003. The deadline to submit reply comments is January 26, 2003. This NPRM is FCC 03-222 in WT Docket Nos. 02-381, 01-14, and 03-202. The FCC adopted this NPRM on September 10, 2003, and released it on October 6, 2003. See, Federal Register, November 12, 2003, Vol. 68, No. 218, at Pages 64050-64072. See also, story titled "FCC Announces NPRM Regarding Regulations Affecting the Use of Spectrum in Rural Areas" in TLJ Daily E-Mail Alert No. 739, September 15, 2003. 11/12. The Department of Commerce's (DOC) Bureau of Industry and Security (BIS), which is also known as the Bureau of Export Administration (BXA), published a notice in the Federal Register summarizing, and setting the comment deadline for, its notice of proposed rulemaking (NPRM) regarding amending the Export Administration Regulations (EAR) to implement a revised version of the BIS's Simplified Network Application Processing (SNAP+) system. This proposed rule also would mandate use of SNAP+ for all filings of Export License applications (except Special Comprehensive Licenses), Reexport Authorization requests, Classification requests, Encryption Review requests, and License Exception AGR notifications, unless the BIS authorizes paper filing for a particular user or transaction. The deadline to submit comments is January 12, 2004. See, Federal Register, November 12, 2003, Vol. 68, No. 218, at Pages 64009-64023. 11/17. The Supreme Court issued a brief order in Nixon v. Missouri Municipal League, Nos. 02-1238, 02-1386, and 02-1405 . It wrote that "The motion of the Solicitor General for divided argument is granted." See, Order List [10 pages in PDF] at page 2. This case pertains to 47 U.S.C. § 253(a) and state statutes that prohibit political subdivisions from offering telecommunications services. See also, stories titled "Briefs Filed With Supreme Court in Nixon v. Missouri Municipal League" in TLJ Daily E-Mail Alert No. 776, November 11, 2003; and "Supreme Court Grants Certiorari in Nixon v. Missouri Municipal League" in TLJ Daily E-Mail Alert No. 687, June 25, 2003..
11/15. The Office of the U.S. Trade Representative (USTR) announced in a release that Deputy USTR Josette Shiner will visit the People's Republic of China from November 15 through 19 for meetings in Beijing and Qingdao. It stated that "Topping the agenda will be intellectual property rights (IPR) enforcement ..."
11/17. The Federal Communications Commission (FCC) released its annual report [210 pages in PDF] for the year ending December 31, 2002 titled "Statistics of Communications Common Carriers". See also, FCC release [PDF] of November 14.